You are my mentor. I adore you, but hell you know that. Love you girl. And, I also don’t want to be known as “that girl”, or “the sick girl”-there is so much more to life. It’s tough but a tough battle I will GLADLY engage in. You have no idea how much this means to me. My entire life and through the very long course that my eating disorder has run thus far, I have never been told that I could be “recoverED”. 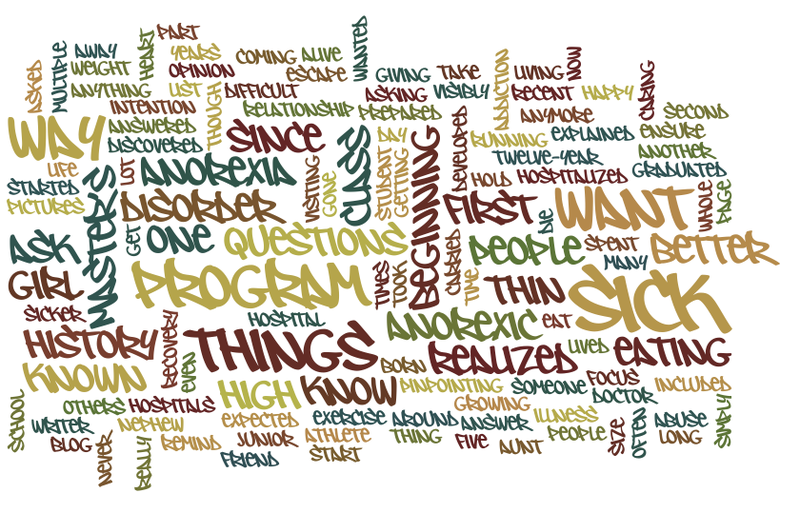 Never once, and we’re talking about some of the worlds leading eating disorder specialists here. It’s been, “you can achieve recovery” or “recovery is worth it”. But never the finite exaction of recoverED. Never the idea that I could not only go back 100% to my healthy self, without fear of relapse, but I could excise the eating disorder from myself…permanently. This is why I live in fear of ever actually achieving “recovery”. Because what comes next after that? What happens? Why would I want to get to the point where I’m ok, but could always rebound even worse than before? Isn’t that just biding my time before I fall again? Your mentality is much, much healthier and it’s a really necessary one for people to read. I LOVE THIS. wonderful job on choosing recovery. i really admire your courage! I got here via Facebook – I just wanted to say that this was really inspiring. Thank you. Your welcome. Thank you for coming. This sounds so positive. I’m trying for recovery (though not from anorexia) and it’s so nice to read about someone who has made it through. I know exactly what you mean about not really being in class, about being taken over by something. I want to be a real person now, with a real life. wow. i remember you from facebook. way before you got better…i was, silently, in my head, competing with you. i’m so glad we’re both better. Indeed nice article you have here. It would be nice to read a bit more concerning such theme. Thank you for posting that data. Thank you for sharing your postings. I find your recovery story inspiring. Rather nice site you’ve got here. Thank you for it. I like such themes and everything that is connected to them. I definitely want to read more soon. This read was really meaningful, the words was absolutely awesome! don’t stop writing. A simply wonderful and amazing blog…I love it. I am so glad I stumbled across it. It gives me hope. It makes me happy and it makes me think. You are an amazing writer and I am glad you gave up the anorexia and used your voice to encourage others to do so as well….THANK YOU!!!!! This is a lot advice. I must say I like reading this a lot. It will help me to turn into better understanding about the subject. It is very well written. I am going to definitely find this content material pretty engaging. I am hoping you can provide more in the future. I only ask that you provide a link to my blog. Can I just say what a aid to search out somebody who actually is aware of what theyre talking about on the internet. You positively know the best way to bring an issue to mild and make it important. More individuals must learn this and perceive this facet of the story. I cant imagine youre not more in style since you definitely have the gift. I’d must check with you here. Which is not one thing I usually do! I get pleasure from reading a publish that can make individuals think. Additionally, thanks for permitting me to remark! It is extremely interesting for me to read that blog. Thanks for it. I like such topics and anything that is connected to them. I would like to read a bit more on that blog soon. I was sicker than some, not as sick as others. I’m alive, though, and a lot of people who were not as “visibly sick” as I was, are not. If the one thing you take away from this page is that you don’t have to be thin to die from an eating disorder, I’ll be happy. I have felt like an imposter for 17 years because only the really thin people are sick, right? And even when I found that holy grail and was being threatened with hospital, I was still not a proper sick person. I was an imposter. Sick is as sick does, not as it looks. Your blog is a gift. I love this post and the way you write. I don’t want to be ‘that girl’ either.